Photo by U.S. Fish & Wildlife Service • The Kirtland’s Warbler, while endangered, is slowly building its numbers with intensive human assistance. Nearly 50 different warbler species nest in the eastern half of the continental United States. The rest of the world’s warblers reside mostly in Central and South America. I’ve been fascinated with the group of small, energetic songbirds known as warblers almost from the start of my time as a birder. Many birds have inspired poetry, but to me, the warblers are poetry. I suppose another, more down-to-earth part of my fascination is that a little effort is usually required to see these birds. Although many species of warblers spend the summer months in the region, few of them would really be described as backyard birds. That being said, I am also fortunate to live in a location surrounded by woodlands that are inhabited by several species of warblers in the months spanning April to September on the calendar. Of course, it’s always gratifying to hear from readers who have also caught the “warbler bug” and find these tiny, colorful songbirds as fascinating as I do. Graham Gardner of Abingdon, Virginia, sent me a recent email about the warblers, an extensive family of neotropical migrants that happen to be among my favorite birds. Photo by Graham Gardner • A Canada warbler wears a dark necklace of feathers across its yellow breast. He reported that the trip was wildly successful. “We observed 10 warbler species in total in just under two days of birding.” Among them were three species that were new for him: cerulean warbler, Blackburnian warbler, and bay-breasted warbler. Graham wrote that he looks forward to searching for warblers in the coming weeks as they continue to pass through, and in some cases settle in, our Appalachian Mountains. I congratulated Graham for his success with some of my favorite birds. I also let him know that he succeeded with a bird — the cerulean warbler — that has been elusive for me over the years. It’s one of the few warblers that spend time in the eastern United States that I haven’t managed to add to my life list. The other two warblers I need are the Connecticut warbler and Kirtland’s warbler. “The cerulean was definitely the highlight of the trip for me,” Graham noted in a second email to me. The cerulean warbler makes infrequent appearances in the region, but it has been observed as recently as the spring of 2016 at Steele Creek Park in Bristol, Tennessee. Some other locations — Frozen Head State Park, Edgar Evins State Park and Falls Creek Falls State Park — support breeding populations of this warbler within the Volunteer State. Unfortunately, the cerulean warbler is one of the fastest declining songbirds in the United States. Habitat destruction in its breeding range in the Appalachian Mountains and its wintering range in South America is to blame for its plummeting numbers. Among a family of several breathtakingly beautiful species, the cerulean warbler is one of the most exquisite of its kind in terms of appearance. Adult males have pale cerulean blue upperparts — hence the bird’s common name — and white underparts with a black necklace across the breast. They also show black streaking on the back and flanks. Beyond its uncommon status, there are other reasons why it’s difficult to lay eyes on a cerulean warbler. First and foremost, cerulean warblers prefer to forage in the treetops. In that leafy, lofty habitat, observing these warblers can be difficult for ground-bound humans. Photo by Bryan Stevens • The Northern waterthrush is a warbler fond of foraging near slow, flowing water. I’ve been very close to seeing a cerulean warbler twice. During a past Spring Naturalists Rally at Roan Mountain, Tennessee, several people watched a cerulean warbler flitting in some tall trees while I struggled unsuccessfully to get my binoculars on the rapidly moving bird. More recently, I was looking for birds with fellow birder Jean Potter along the Watauga River in Elizabethton, Tennessee, for a Fall Bird Count. She found a female cerulean warbler in a tree overhanging the river, but I failed to get my binoculars on the bird in time. So, while my luck with cerulean warblers hasn’t changed (yet), I have seen several warblers at my home this spring, including hooded warbler, ovenbird, black-throated green warbler, black-and-white warbler and Northern parula. In addition, I’ve seen other warblers — yellow-breasted chat, Cape May warbler, yellow warbler and chestnut-sided warbler — at other locations in the region. Photo by Graham Gardner • The black-and-white warbler, which is aptly named, is one of the most easily identified warblers. The warblers are poetry written with splashes of movement and hints of color written across an often green background. While not easy to observe, they’re worth seeking out. Glimpsing one of these energetic songbirds is always a moment that puts a smile on my face — and in my heart. Bryan Stevens lives near Roan Mountain, Tennessee. To learn more about birds and other topics from the natural world, friend Stevens on Facebook at http://www.facebook.com/ahoodedwarbler. He is always posting about local birds, wildlife, flowers, insects and much more. If you have a question, wish to make a comment or share a sighting, email ahoodedwarbler@aol.com. This entry was posted in Birding, Birds, Bristol, Elizabethton Star, Erwin Record, Spring birds, Spring migration, Uncategorized, Warblers, Worm-eating warbler, Yellow-breasted Chat and tagged Bird, birds, Bristol Herald Courier, Elizabethton Star, Erwin Record, John James Audubon, Johnson City Press, McDowell News, nature, warblers on June 11, 2017 by Bryan Stevens. I’ve always been a warbler fan, celebrating every opportunity that comes my way for seeing these colorful, energetic feathered sprites. In early May I got to introduce some other bird enthusiasts to some of our warblers during a bird walk at Sycamore Shoals State Historic Park in Elizabethton, Tennessee. Yellow-breasted chat, one of the warblers observed during the morning stroll, always stands out from the rest of the flock. Photo by Roy Knispel Regarded as the world’s largest warbler, the yellow-breasted chat is a noisy oddball among this family of New World birds. 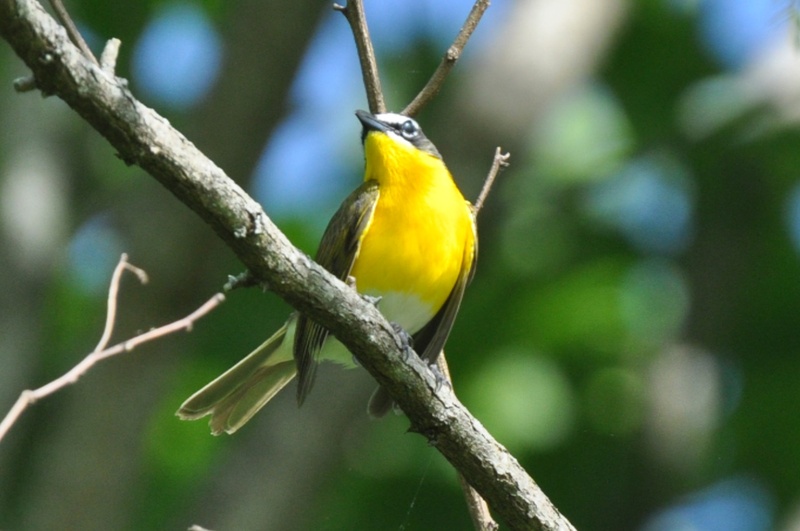 The Yellow-breasted Chat has long held a unique distinction among the New World wood-warblers as the largest member of this diverse family of neotropical birds. 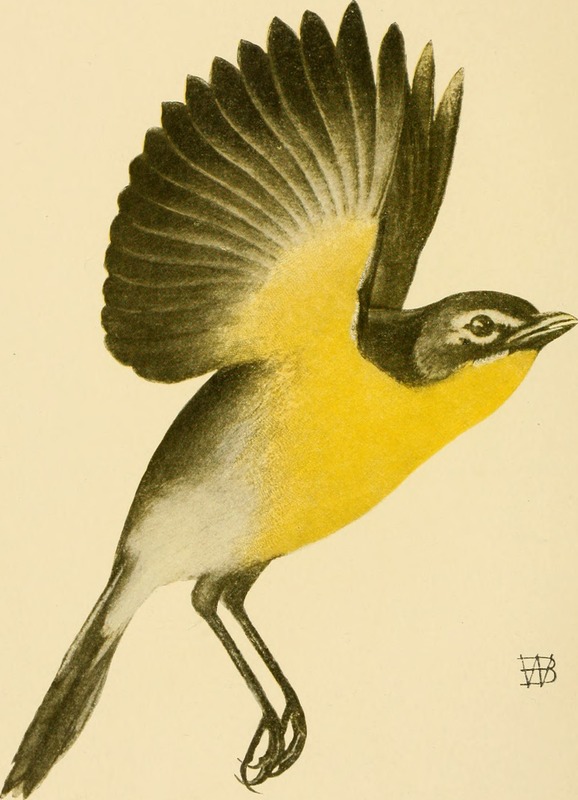 Some experts, however, have always questioned whether the Yellow-breasted Chat is truly a warbler. The jury, based on my research, is apparently still out. Personally, I hope the chat continues as a member of the warbler clan because what family doesn’t need its big, goofy oddball? If nothing else, the yellow-breasted chat is truly an the odd bird out among the little birds known as warblers that spend most of their time constantly on the move, flitting from branch to branch in hyperactive bursts of activity. Photo by Bryan Stevens A Yellow-breasted Chat perched atop a tree to survey its surroundings. Yellow-breasted chats aren’t more sedate than other warblers, but they don’t dart about in the treetops in the same way as might a Northern parula or blackpoll warbler. During the spring ritual of attracting a mate, the males are obsessed with constant singing and performing. The performance portion of the program consists of awkward, drooping flights into the open before plunging back into thick cover. Males will also select an elevated perch in the open to proclaim their availability through song for any listening females. There are many other ways they stand out on the warbler family tree. For instance, yellow-breasted chats are significantly bigger than all other warblers, reaching a length of 7.5 inches with a wingspan of almost 10 inches. The two sexes look alike, which is something else that separates them from many, but not all, warblers, which are generally known for the differences in appearance between males and females. The yellow-breasted chat has olive-green upperparts with white bellies and bright yellow throats and breasts. These chats also have long tails and heavy bills. A prominent characteristic is a spectacle-shaped white eye-ring. Early American naturalist and painter John James Audubon painted this family group of Yellow-breasted Chats. I have observed yellow-breasted chats in many locations in the region, but during my early years birding this was a very elusive bird for me. It took me a couple of years to get my first satisfactory look at this interesting bird. Chats prefer habitats such as dense thickets and other underbrush, which offers remarkable concealment from prying eyes. Chats are loud birds at most times, producing a variety of odd vocalizations, which means they are often heard before they are seen. 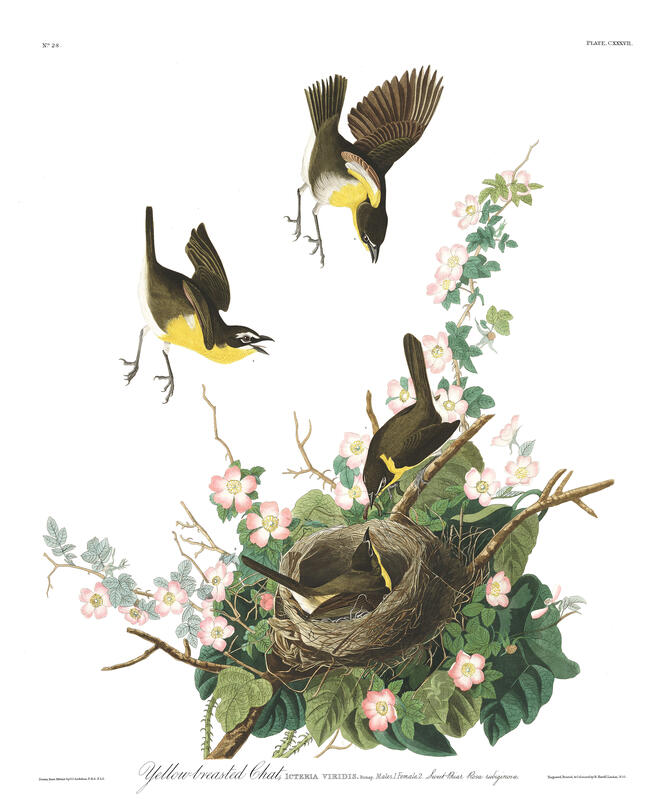 The online Audubon Guide to North American Birds describes these sounds as “a bizarre series of hoots, whistles, and clucks, coming from the briar tangles” and labels them a reliable means for determining the presence of a yellow-breasted chat. By learning these vocalizations, you’ll increase the chances of finding one of these birds during time spent outdoors. Photo by Bryan Stevens Along with such birds as Brown Thrashers, pictured, Yellow-breasted Chats prefer thickets and other brushy, dense habitats. The chat’s habitat preferences and its repertoire of vocalizations makes it easy to associate these birds with others that share the same dense, brushy habitats and a penchant for making unusual vocalizations. 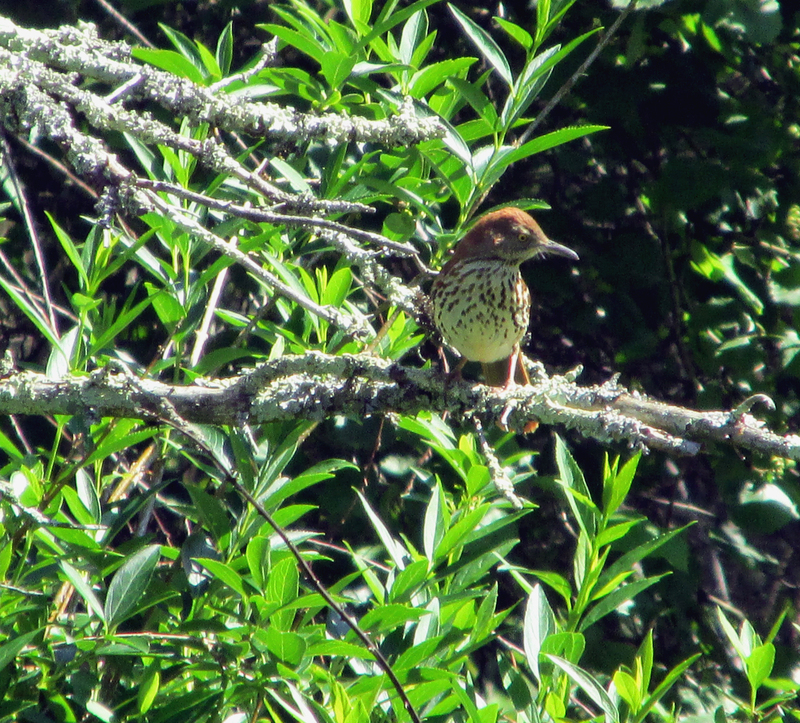 Birds often found in proximity to chats include brown thrashers, gray catbirds, white-eyed vireos and Eastern towhees. Habitat loss has resulted in a steady decline of yellow-breasted chats in some parts of their range. It is a widely distributed bird, spending the nesting season from southern Canada to Mexico. Most chats retreat to Mexico and Central America for the winter months. This chat mostly feeds on insects, supplementing its diet with berries that ripen during the summer months. The Yellow-breasted Chat is considered the world’s largest warbler. Female chats usually lay three to four eggs, but both parents care for the young. Young chats are usually ready to leave the nest only eight days after hatching, but they will remain dependent on their parents for food for a couple of weeks. Chats usually nest twice each during the nesting season. I’ve only observed a yellow-breasted chat on one occasion at my home. That individual, a fall migrant, was a delightful surprise. 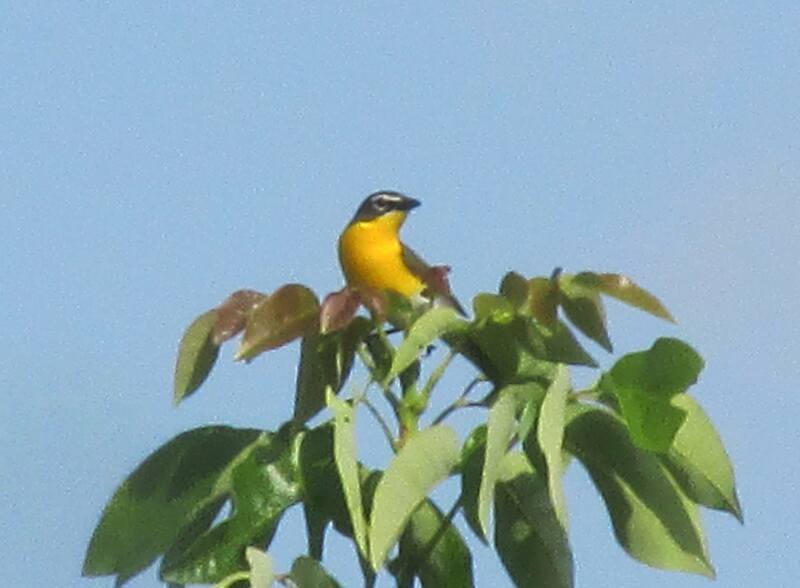 The yellow-breasted chat is usually a bird that I have to make an attempt to find. It’s worth the effort to gain a good look at this big, brash member of the warbler clan. Three other chats, all birds of tropical regions, were moved out of the warbler clan in 2009 by the American Ornithologists’ Union. Experts now believe that the rose-breasted chat of South America, the gray-throated chat of Mexico, Guatemala and Belize and the red-breasted chat of the Pacific slope of Mexico are more closely related to cardinals and tanagers than warblers. 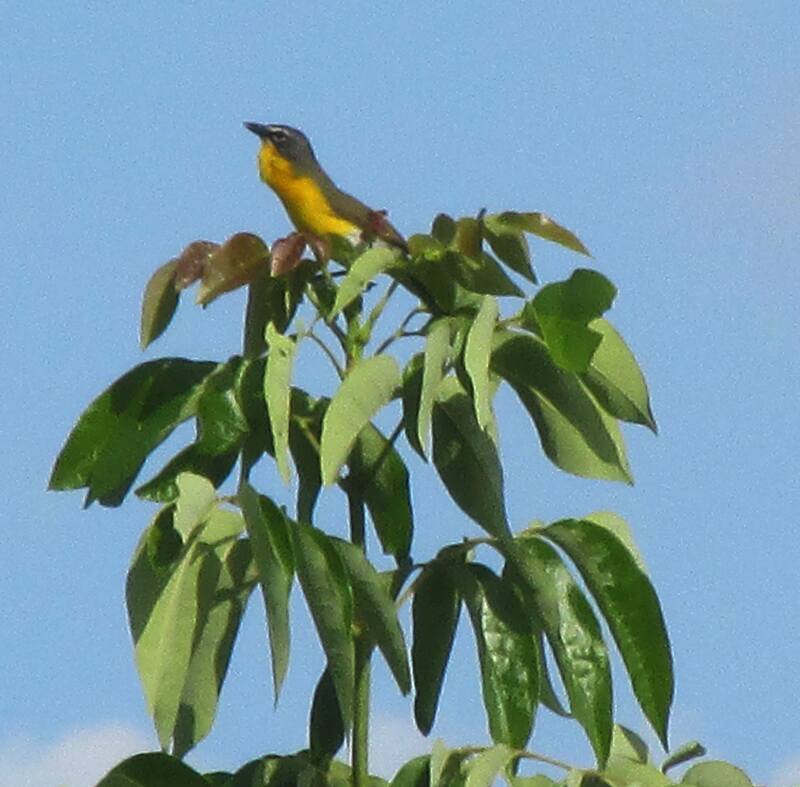 The AOU, should it one day make that decision for the yellow-breasted chat, is likely to classify this oddball bird as a member of the Cardinalidae family of birds. Photo by Bryan Stevens Usually retiring and reclusive, the nesting season makes male Yellow-breasted Chats seek elevated perches for producing an array of unusual vocalizations. This entry was posted in Birding, Birds, Yellow-breasted Chat and tagged Birding, birds, Bristol Herald Courier, Carter County Compass, Elizabethton Star, Erwin Record, Feathered Friends, McDowell News, Our Fine Feathered Friends, The Erwin Record, warblers, Yellow-breasted Chat on June 7, 2015 by Bryan Stevens.